You will never be bored while vacationing in Southwest Montana, with so much to do all year round, there is something for everyone in every nearby town! Winter brings an abundance of snow and sunshine for the pleasure of outdoor enthusiasts. World class snow sports include alpine and Nordic skiing, snowboarding, and trekking, along with snowmobiles, sleigh rides and much more! Summer is perfect for fishing, horseback riding, hiking, mountain biking, cycling, rafting, river floating, kayaking, and golfing. If respite, relaxation, and solitude are what you are seeking; the natural grandeur of Montana's national forests, mountain peaks, parks, and alpine lakes will feed your mind, body, and soul. There are hundreds of miles of trails, mountain streams, and wildflower meadows to explore. The expansive vistas create the perfect inspiration for writing, painting, photography, and rejuvenation. 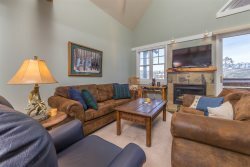 Explore our home base communities of Bozeman, Big Sky, Livingston-Paradise Valley, and West Yellowstone to find the perfect home base for your trip. Though all unique, each town provides additional educational, cultural, culinary, and entertainment opportunities great for the entire group. Not sure where to start? Stay Montana's concierge service can provide customized recommendations for you at your request. We look forward to helping you create your own Montana escape, start by browsing avaialble rentals now! Discover the best in fly fishing, with world-class waterways in Southwestern Montana. Perfect for the entire family, the combination of things to do and our wonderful waterfront properties make the area a top vacation destination! Livingston is a small town with a rich cultural heritage, located on the bank of the Yellowstone River. Located near the beautiful Paradise Valley, there are many nearby attractions, events, and activities available when you visit. Discover the eclectic downtown blend of dining, arts, theater, shopping, and music for every taste. Yellowstone National Park is nearly 3,500 square miles of wilderness ecological and recreation area. Yellowstone features dramatic canyons, rivers, lakes, hot springs, lush forests, thermal features, mud pots, and geysers, including its most famous, Old Faithful. It`s also home to hundreds of wildlife species including bears, wolves, bison, elk, antelope, and more than 150 species of birds including bald eagles, osprey, and peregrine falcons.